I paint furniture every week, and though I always work on a piece until I'm happy with it, when I paint with Annie Sloan's Aubusson Blue, it's GUARANTEED to be a favorite of mine. All of Annie's colors paint beautifully and are so distinct, which is what makes them perfect for mixing to create new colors. Aubusson does mix nicely [and I've got a new dresser to share next week where I did just that!] with other colors, but in its purest form, it's truly stunning. This particular dresser I found for a friend/client of mine who needed a storage piece for the entry of her home. Her color palette is very neutral with a coastal, beachy vibe. I was sure she'd want me to paint it in something to continue with the neutrals in the rest of the space. To my surprise she stepped out and requested Aubusson Blue and I couldn't have been more thrilled! This particular blue has a depth and structure to it that makes it perfect for an accent piece that will help ground a room. When opening the front door, this dresser would stand on the adjacent wall to the right, and directly in anyone's line of sight. Since there were already other hints of blue in the room [found in art and pillows], the dresser fit in beautifully. For my own portfolio, I shot the dresser in my home and styled it with a few items in her color scheme, just to show how well it works with the neutrals and corals found in coastal design. I can't wait to see how we'll style the dresser [hopefully with a stunning mirror above it] with functional, yet beautiful accessories! I refinished the original hardware in a classic gold, and it really just pops off the deep hues of blue. With Aubusson Blue, I almost always top it with a layer of dark wax [after a coat of clear]. Without the dark wax, it can sometimes read a little too bright, and I thought the dark wax would help elevate the rest of her home. She has newly stained dark wood floors, and this take on Aubusson blue works with them effortlessly. I'm still shocked I don't have a piece in Aubusson Blue in my own home, since just looking at photos of it immediately makes me happy. I need to figure out how to work this gorgeous color into my own space stat! 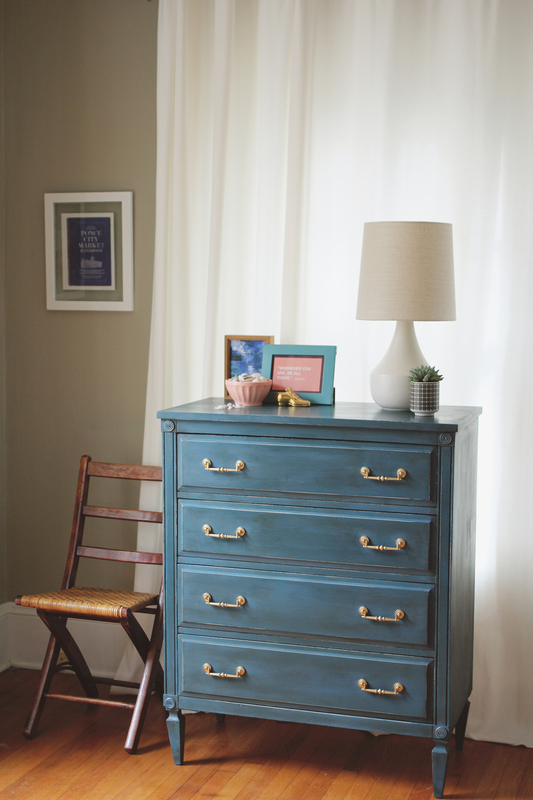 Check out my painted furniture portfolio to see other pieces I've painted with Aubusson Blue!